Yun Ho Kim received his B.S. (2003), M.S. (2006) and Ph.D (2010) degree in Chemical and Biomolecular Engineering from the KAIST under the supervision of Prof. Hee-Tae Jung. His doctoral research was focused on the fabrication of large area micro- nano patterns by defect-assisted liquid crystalline structures for opto-electronic applications. At present, he is a post-doctorial research associate at Washington University in St. Louis working with Prof. Younan Xia from November 2010. 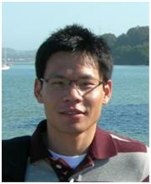 His current research interests are focused on the study of the synthesis and self-assembly of novel metal nanostructure in confined microfluidic system for catalysis and energy storage applications. Scanning Electron Microscope (SEM) image shows modulated smectic liquid crystal defects by thermal sublimation. These 3D-complex structures were originated from toric focal conic domains (TFCDs) at the air/LC interface in thin film. For the sublimated TFCDs, premade normal TFCDs were annealed at slightly under isotropic temperature (180°C) for 2 minutes on the hot stage of a Mettler FP82 and FP90 thermosystem. The sample for the SEM (Sirion FE-SEM, FEI, NNFC in KAIST) was coated with a 5-nm layer of Pt to improve electron sensitivity and to protect the sample from electron beam damage. To prepare sample for direct examination by SEM, LC films containing various morphologies were frozen to soft crystal phase in liquid N2. Liquid crystals can be thermally sublimated in the fluid smectic phase, and that in such a process the LC material is removed layer-by-layer. Even in small molecule high temperature fluid smectic A phases, the underlying layer structure can successfully resist surface tension (which tends to smooth out the advancing interface), to yield a surface topography that exhibits that of the underlying layer structure. 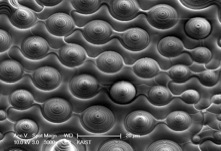 The SEM image shows the smooth, curved surfaces of smectic layers terminated by distinct discontinuities, indicating that in the sublimation process the material is removed by the nucleation coalescence and growth of holes in the layers. Jury comment: an unconventional view on focal conics. Self-organized smectic structures almost give the impression of artificial design.